The Australian Government with agreement from all states and territories, made a national declaration to review arrangements within their respective jurisdictions and remove unnecessary barriers to the killing of cats. This was to allow governments to access $50 million for cat eradication programs announced as part of the national Agriculture Competitiveness White Paper. The results in the first year since the program launched? Over $11 million invested in companies and programs that kill cats, with a special focus on WA, who received nearly $2 million dollars to trial new baits for national rollout. And an estimated 211,000 cats culled across Australia in the first year. From NITV News..."In 2007 when the army rolled into Central Australia - a tiny outback community in the shadow of Uluru found itself at the centre of a media storm. Allegations of social dysfunction and child sexual abuse were broadcast around the World." - An estimated 211,000 feral cats culled across Australia due to national effort. - We have overachieved on this target with 1.4 million hectares of feral cat management in Western Australia alone. Different techniques being used include aerial baiting, skilled shooting and trapping, detector dogs, exclusion fencing, cat squirter traps and Indigenous hunting. - Over $11 million invested in feral cat control action and research. - Curiosity® cat bait approved and deployed; This target was partially met. Assessment by the Australian Pesticides and Veterinary Medicines Authority is ongoing and has delayed delivery of this target. Approval is expected in March 2017. A commercialisation strategy is underway. - Increased connection with Indigenous Ranger groups and the approval of Curiosity® feral cat bait will help grow open landscape action on feral cats and increase threatened species populations on the mainland. - In the last 12 months, Ecological Horizons has begun testing and trial deployment of the cat squirter trap, a cat specific robotic bait station that selectively targets feral cats. This technology will overcome some of the barriers to controlling feral cats in remote and regional Australia... The Australian Government invested $100,000 to help develop the prototype into a final product, creating another innovative, humane and effective feral cat management tool. "I have been Threatened Species Commissioner for almost 16 month... With feral cats already contributing to 28 mammal extinctions (debunked here) and threatening the survival of another 142 unique Australian animals, the Threatened Species Strategy’s feral-cat targets are ambitious – to cull two million cats and to establish five feral-cat free islands, 10 large mainland predator exclosures, and 12 million hectares of best practice feral-cat management, all by 2020. Action towards these targets has already commenced as a result of the $5.4 million announced at the summit to tackle feral cats. 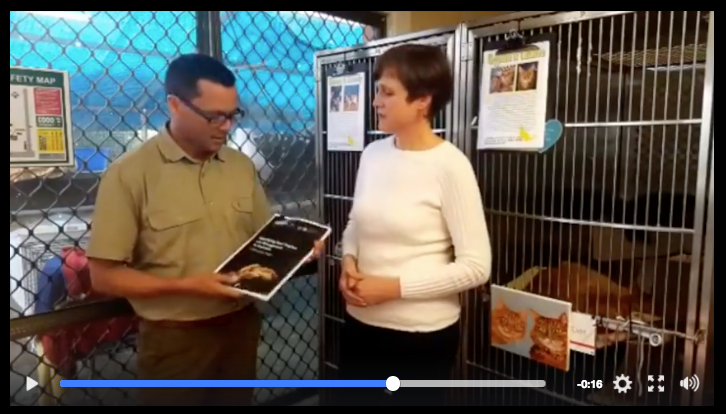 Work to eradicate feral cats is intensifying at a number of important sites across Australia and, with strong community support, momentum is building for much more." A feral-cat taskforce has been established. Meeting the Threatened Species Strategy’s ambitious feral-cat targets will require concerted national effort. On 1 December, I chaired the first feral-cat taskforce meeting. The taskforce will help consolidate and strengthen actions by states and territories and natural resource management organisations to eradicate feral cats. In addition to the states, territories and NRM organisations, the taskforce also includes the Department of Agriculture and Water Resources, the RSPCA, the National Environmental Science Programme and Threatened Species Scientific Committee representatives, the Invasive Species Council and Invasive Animals Cooperative Research Centre. On 17 July, the Australian Government, with agreement from all states and territories, made a national declaration in relation to feral cats. All states and territories will review arrangements within their respective jurisdictions and, where necessary, remove unnecessary barriers to effective and humane control of feral cats. This will allow new feral-cat eradication programmes to access the $50 million for management of established pest animals announced as part of this year’s national Agriculture Competitiveness White Paper. Investment and partnership with the private sector will be another important focus over the next 12 months. The Threatened Species Strategy confirms the Australian Government’s commitment to encouraging and brokering environmental investment through partnerships with the private sector. A lesson I have learned from across the Tasman Sea is the significant role that the private sector can play. Half of the New Zealand Threatened Species Ambassador’s salary and all of her air travel costs are covered by Air New Zealand.